Cranleigh Golf and Country Club have raised an amazing £13,841 to support Jigsaw Trust’s specialist adult day service; JigsawPlus. As the combined Captains’ charity of the year, the golf club have organised a range of fundraising activities in support of Jigsaw. The funds raised have already been used to purchase much needed gym equipment for our adult learners. In addition, a larger proportion will be used to fund a Recreation Area which will form part of Jigsaw’s GARDENworks Nursery, an exciting new project which will start in April and is due to be completed in August. 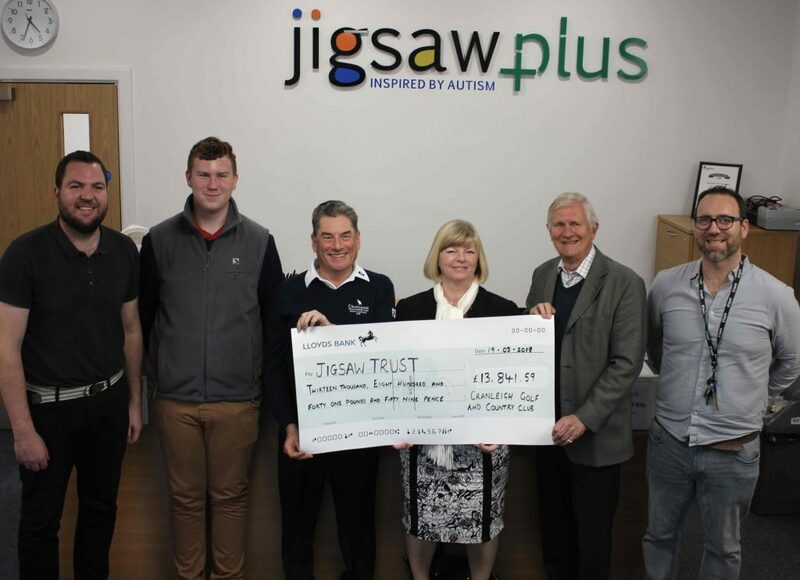 Cranleigh Golf Club’s Mo Plamer, Leo Wilson, Bob Owen, Nick North and Rita Elliott all visited JigsawPlus to present the final cheque following an incredible year of fundraising.